The "freshman 15," as it's affectionately called, refers to those rumored pounds of fat that creep onto the frames of students embarking on their new and exciting collegiate journey. From dining-hall dangers to stress and no sleep, college lays out the perfect recipe for packing on the pounds. Wait a minute… are our nation's freshmen really straying that far from sensible eating and lifestyle habits? Probably, yes. No parents! But there's more to the story of the freshman 15 than you realize. 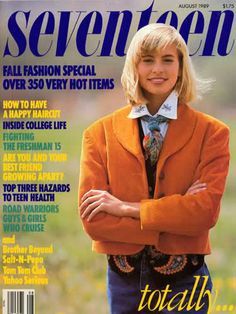 The first printed use of the term was in a 1989 issue of Seventeen magazine. Emblazoned as a subhead on the cover was "Fighting the Freshman 15," and the rest was body-shaming history. Who knew that what began as a grabby, alliterative cover hook to sell magazines would soon begin circulating around the United States and Canada as a real, fear-inducing phenomenon. A seemingly infinite number of articles have covered it in the time since, offering preventative measures and survival tactics. As for the scientific veracity of the term? Completely unsubstantiated. Fifteen pounds is a gross overestimation of the actual weight gain that incoming freshmen can expect. Research done by Ohio State University shows that the average student gains just 2.5-3.5lbs in his or her first year of college. 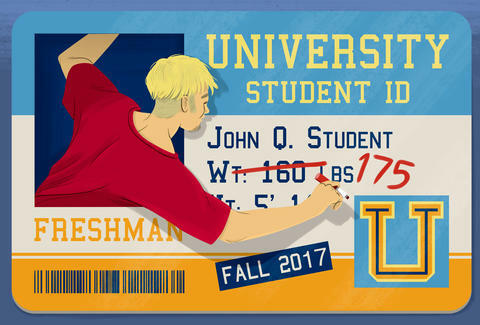 "The 'freshman 15' is a media myth," says Jay Zagorsky, co-author of the study. "Repeated use of the phrase… may contribute to the perception of being overweight, especially among young women." This unsupported number 15 may even be leading to the opposite effect: one in four study participants reported actually losing weight their first year. A 2008 study found that of the participants monitored, only half gained any amount of weight, suggesting that the freshman 15 isn't a trend at all, but rather a case-by-case consideration. Which honestly makes way more sense and should be pretty reassuring. What the Ohio State study actually found is that weight gain may have nothing to do with being in college. The typical freshman only puts on a half-pound more than a peer of the same age who doesn't go to college. What's more likely is that geographical changes are responsible for weight gain. Many students leave home for college, sometimes heading to completely different parts of the country. This American obesity map shows the prevalence of overweight adults by state and territory. If college takes you from, say, California to Mississippi, the lifestyle and diet changes that come with that relocation may be the real cause of any first-year pound accumulation. If you matriculate in one of the country's fittest cities, however, you may experience a slim-down. OK, so the country's freshmen aren't all gorging themselves on dining-hall buffets and endless soft serve. Do you hear that, MOM?! Yes, they're eating vegetables sometimes! But that doesn't mean the kids are totally all right. The Ohio State study reports that the typical woman will gain an average of 7-9lbs over her four years of college, and the typical man is looking at 12-13lbs. And hey, some of that may be due to the fact that people may still be growing and filling out. Post-graduation, weight gain continues at an average of 1.5lbs per year, a trend that can quickly add up if you're not careful. So while there's no need to fear the initial body-shock of the freshman 15, there's something to be said for being conscious of health and lifestyle choices throughout all four years. College is the time when most people transition into independent, (semi-)functioning adults. While 2am pizza is a delight that can be experienced well into adulthood, it starts to take its toll the older you are. The bottom line, as always: college kids, stop complaining. You don't know how good you have it. Sarah Anderson is a former Thrillist employee and current law student. She just started school again and refuses to make eye contact with a dining hall. Keep her on track @smileforsarah and @sarah_jfa.